The ATP Synthase (Wikipedia article) is a two-part molecular machine – a rotary motor and an ATP generator coupled together by a rotating driveshaft. It’s made of proteins, and in each one of our 100 trillion cells is many hundreds of these tiny biological machines. Their diameter is 10 nanometres – 10,000 of them side-by-side make up the width of a human hair. They rotate at about 200 revolutions per second, generating the universal energy currency for life, ATP (adenosine triphosphate). ATP provides energy for most biochemical reactions, including DNA replicating, repair, and protein synthesis, muscle contraction, transport of nutrients, and neural activity, to name just a few. Each one of our countless trillions of ATP Synthases produce about 600 ATP molecules per second. Overall they generate our body weight in ATP per day. If they ever stopped, we would be dead before we hit the ground. 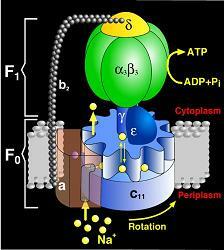 In fact, that is how the poison cyanide works – it blocks the flow of hydrogen ions used to drive the ATP Synthase. They are in every cell of every plant, animal and human. In plants, they are powered by the sun (photosynthesis), whilst in most organisms including us, they are powered by the food we eat. Amino Acids are the building blocks of proteins. There are 20 different amino acids which are all responsible for making a protein a certain way. Nine of these 20 amino acids are defined as “essential amino acids”, as our body does not synthesize them. We need to consume them in the form of protein or they will not be present in our body. Proteins are made of a combination of amino acids. The amino acids are bonded to each other to form a chain which is then folded into a 3-dimensional structure. They form parts of our physiology – hair, skin, muscle, connective tissue, etc. They also make up the antibodies for our immune system, hormones, haemoglobin and enzymes. Proteins are continuously constructed in our cells by enzymes that read and decode (express) genes stored in our DNA. A gene is a section of genetic code which specifies the sequence of amino acids for the protein/enzyme the gene is coding for. Enzymes are functional proteins. They are catalysts – they speed up the rate of biochemical reactions, carrying out a specific function by interacting with other molecules. Most biological reactions occur very quickly, thanks to the help of enzymes. They are also the biological molecular machines inside cells, replicating, transcribing, translating, proofreading and error correcting DNA. They also perform other functions in cells such as transporting molecules etc. The ATP Synthase is an enzyme consisting of 31 proteins, which all have their amino acid sequences coded in specific genes – the blueprint is stored in DNA using genetic code. ATP (adenosine triphosphate) is an energy transfer molecule. It’s a molecule made of one biochemical compound called adenosine and three linked phosphates (A=adenosine, T=”tri” for “3”, P=phosphate). ATP releases its energy when one of its phosphates is released. The resulting “spent” molecule thus only has 2 phosphates and is called ADP (adenosine diphosphate – the “D”=“di” for “2”). ATP Synthases use mechanical force from its rotating camshaft to attach a phosphate to ADP making it ATP which stores the energy used to attach it. The phosphates are negatively charged so they are repelling each other, but since they are bonded together, they are under tension (thus storing energy). ATP molecules are transported around the cell for everything that needs energy, and the energy is taken from ATP by releasing the third phosphate (a process called hydrolysis), converting it back to ADP. This ADP (and the loose phosphate) make their way back to an ATP Synthase to repeat the process. A good analogy for ATP<–>ADP are springs. ADP is like an uncompressed spring, relaxed. ATP Synthase uses mechanical force (kinetic energy) to compress the spring and a catch is flipped, keeping the spring compressed thus storing the energy. This spring can then be grabbed by another machine somewhere, which releases the catch thus allowing the spring to expand, releasing the energy it was holding, to do whatever work that particular machine is doing. We’re now left with the relaxed spring (ADP) to be sent back to be compressed again. The source of the H+ unbalance comes from the food we eat or in the case of plants, from sunlight. This process is called Cellular Respiration and consists of other complex motors and machinery embedded in the inner mitochondria membrane as well. Here’s a huge surprise which I’ll only touch on here - it’s reversible! 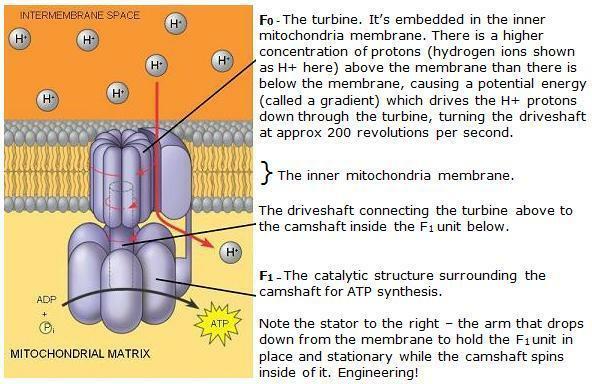 When required (a survival tactic), the lower F1 unit reverses and takes in ATP and hydrolyses it back into ADP, using the energy to drive the F0 turbine above it as a highly efficient proton pump, pumping the H+ protons back above the inner mitochondria membrane without using food resources. This bi-directional design is incredibly ingenious and resourceful. According to the evolutionary timeline, the Late Heavy Bombardment ended 3.9 billion years ago. This was supposedly the end of the earth’s formation and cooling, and when life could appear via abiogenesis (life from non-living chemicals). According to Wikipedia, the Last Universal Ancestor (the organism that evolutionists believe all life on earth – plants, animals and humans – descended from) lived “3.5 to 3.8 billion years ago” – 100–400 million years after earth was habitable. The genetic code was based on DNA / DNA composed of 4 nucleotides / genetic code composed of 3-nucleotide codons / DNA was kept double-stranded by a template-dependent DNA polymerase / integrity of DNA was maintained by a group of maintenance enzymes (proofreading & error correcting) / the genetic code was expressed into proteins via transcription and translation enzymes / ATP was used as an energy intermediate. So, we’ve got 100-400 million years (not billions of years) to go from non-living chemicals to functioning cells using DNA to store digital, formatted information, 100’s of thousands of nucleotides coding for the many enzymes (biomachinery) for replication, transcription, translation, and repair, the ATP Synthase somehow first constructed using no ATP (in fact no biomachinery is possible without ATP), and the vicious circles overcome (e.g. the decoding-enzymes decoding themselves, and without ATP, etc). Not to mention the incredible ingenuity of this and all the other biological molecular machines working in our cells – design is not only necessary, it’s obvious. The Bible states in Genesis 1 that God made all plants, animals, and humans fully-formed, alive, and perfect (He called His creation “very good”). This means that our DNA and genetic code was perfect, written by God Himself. Then the Fall occurred, which corrupted all of creation in many ways including bringing death, disease and suffering into the world, and it’s been going downhill ever since. What we see today is genetic meltdown. There are currently over 4,000 genetic diseases caused by mutations (evolution’s so-called fuel) and these are increasing because our genomes can only degrade due to these constant mutations (copying errors) regardless of natural selection. This proves that we are moving away from genetically ideal – which is the opposite of evolution. Evolution can’t explain this but creation can.